Planting on an incline requires some planning to make sure your plants will thrive. This guide is about gardening on slopes. 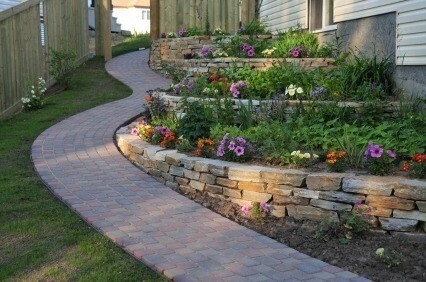 Slopes can be tricky areas to plant. They present unique growing conditions, dry soils and excessive erosion. They can be physically difficult, even dangerous, to maintain. Here are some tips for taming your slopes, as well as how to know when its time to call in the experts. Dry soil - The soil on slopes tends to be dry because the water runs downhill before it gets the chance to soak into the soil. South facing slopes present an even great problem, because in addition to fast run-off, plants also receive intense sunlight during a good portion of the day. As a result, plants on the slopes are subject to uneven moisture distribution that can cause scorching and desiccation. Using a slow delivery system like a soaker hose or a drip irrigation system can greatly reduce the amount of run-off. Uneven nutrient distribution - Another issue unique to slopes is uneven nutrient distribution. Rainfall makes applying fertilizers difficult and usually results in an excess concentration of nutrients at the bottom of the slope. One way around this is grow native plants. These plants are tougher than most when it comes to withstanding poor soil conditions, and stay attractive year-round. Increased erosion - Exposed soil on a steep grade needs to be covered with plants as fast as possible to prevent erosion. When selecting plants, start out with the largest you can afford. Plant them as close together as possible and utilize mulch and landscape fabric or landscape mesh to help anchor the soil until the plants fill in. Remove the sod layer with a square-edged shovel, or rent a sod-cutting machine. When you are finished, clear the area of any remaining leaves, stones, and other debris. Save yourself some work later by taking time to dig out and remove the roots of any existing weeds. Once your ground cover becomes established, it will be much harder to remove invading weeds. If the soil is compacted and infertile work in some organic matter to improve drainage and water retention. Follow with a slow-release (granular) fertilizer. Protect newly exposed soil and plantings by covering the area with a fabric barrier to suppress weeds and prevent erosion (see landscape fabric/mesh, below). Set in each plant to the depth of the root ball, then fill in and firm up the soil. 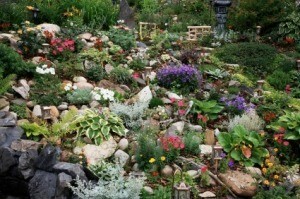 Use excess soil to create a small basin on the downhill side of each plant to collect water. Space the plants as close together as you can so they fill in as quickly as possible. Staggering the rows will help prevent rain from creating gullies between your plants and encourage them to fill in more evenly. For a list of plants or shrubs suitable for slopes in your hardiness zone, contact your states agricultural extension agency, or talk with nursery professionals in your area. Professional landscapers often use landscape fabric or landscape mesh to help control weeds and erosion. Landscape fabric - This fabric is rolled over the prepared ground before planting, and holes are cut into it for individual plants. Unlike landscape mesh, landscape fabric does not decay. It's a good choice for suppressing weeds and anchoring soil around individual shrubs, however its tight weave will prevent ground cover plants from sending out runners and filling in. Landscape mesh - If you are planting ground cover plants that spread through runners, this fabric is the best choice. Its loose weave helps anchor the soil, while still allowing plants to spread. Landscape mesh is biodegradable and breaks down approximately two years after being installed about the time it takes for most ground covers to become established. 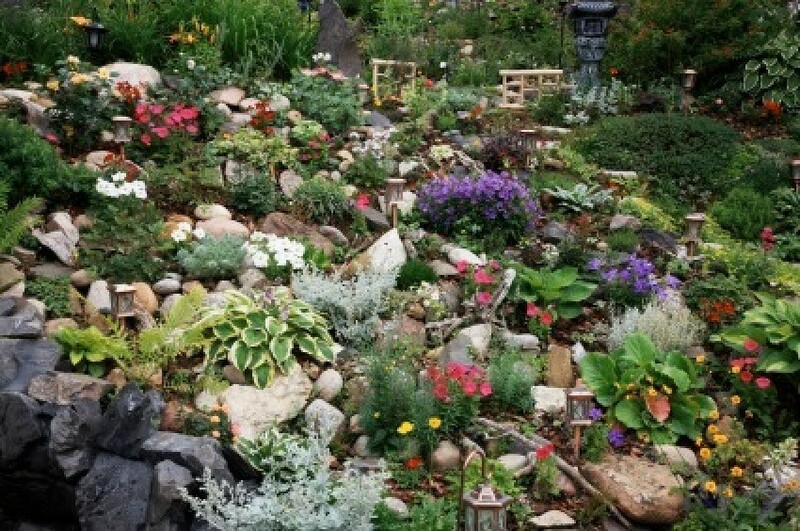 Gentle slopes (20 degrees or less) can be planted fairly easily by most homeowners. 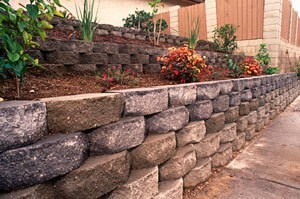 Moderate slopes (between 20 to 30 degrees) are steep enough to warrant a short retaining wall, or at least large groups of stones to hold down the soil. Another alternative is to erect a series of terraces held in place with landscape timbers. If this type of construction is beyond your level expertise, don't be afraid to call in the experts. This is especially true if youre planning to build a deck off the side of your house that overlooks a steep slope, as it may require special supports and footings to stabilize the soil. If the slope on your property is greater than 30 degrees, or simply inaccessible, you may just want to cover it with spill rock an attractive, yet practical solution. Not everyone has the luxury of gardening on perfectly flat terrain. In areas where houses are constructed to take advantage of stunning views, homeowners are often left with the challenge of gardening or landscaping on steep sloping lots. If this sounds like you, here are some strategies for gardening on slopes. Since ancient times, farmers have been using terraces to utilize mountainous terrain for growing food. Today, this technique is still being used by farmers in Peru, Vietnam, Thailand and parts of Southeast Asia. When adapted on a smaller scale, this technique offers gardeners a good way to cope with steep slopes. The idea is to create steps on the site by shoring up the land with walls made from rock, concrete blocks or landscaping timber. The rocks can be buried mid-way into the soil or held in place with steel pins. The idea is to create a flat surface for planting that will retain water and soil, but still allow for drainage. Wire landscaping mesh can be used to prevent soil and seed loss until plants mature. Steep slopes can be difficult to maintain, especially with the lawnmower. One option is to use a more natural approach to garden design with clumps and drifts of attractive native plant species. Over time, the plants will evolve and develop just as they would in a natural setting. Once the correct species of native plants become established, there will be no need to amend the soil with fertilizers, and watering and weeding will be kept to a minimum. A local nursery specializing in native plants will be able to educate you on which species are best suited for your particular site. Planting fast-growing ground covers is another labor-saving solution for creating attractive slope gardens. Young plants will become established more quickly if the soil has been well prepared in advance of planting. Use ground covers started in smaller pots to avoid the difficulty of transporting large, heavy pots to the site. Use liberal amounts of mulch to control weed growth and soil erosion until plants have had a chance to become established. Shrubs: buffaloberry, dwarf bush honeysuckle, cotoneaster, hedera, hypericums, sea buckthorn, sumac, juniper, potentilla, silverberry, gray dogwood, snowberry, red currant, Saskatoon berry, pachysandra, pasture rose, shrubby penstemon. Grasses: blue fescue, Canada wild rye, Indian grass, big bluestem, little bluestem, sideoats grama grass, panic grass, prairie dropseed. Ground Covers: barren strawberry, bunchberry, moss phlox, bearberry, coastal strawberry, cinquefoil, vinca, stonecrop.